Godzilla Movie Review - Are You Screening? Taking on Godzilla is a challenge filled with so many obstacles that the best you can hope for is a mediocre, fairly brainless bit of entertainment. But, it turns out that maybe that’s only true if you’re trying to spin things into a “modern” version of the story in a more serious way, as was the case with the 1998 version. Spanning decades, and providing an explanation for “nuclear tests” many years ago, Godzilla kicks off with the discovery of a giant skeleton with strange, and also pretty giant, pods, one of which has hatched into the mega-monster that we’re calling Muto. Because these monsters feed on radiation, the monster makes its way to the nearest nuclear plant, which is in Japan. 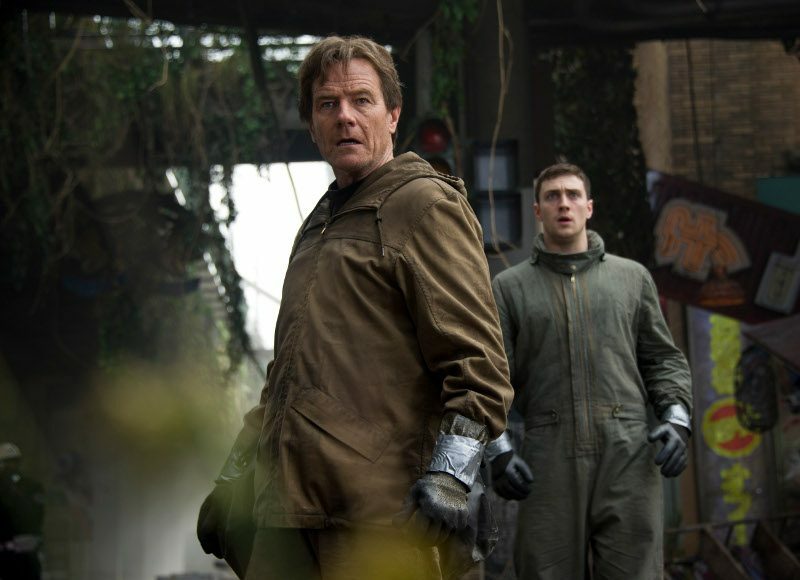 Joe and Sandra Brody (Bryan Cranston and Juliette Binoche) work in the plant, and even though we never see the creature, his burrowing causes a catastrophic accident that destroys the plant, and Sandra is killed. Fast forward a dozen years or so and we find Ford Brody (Aaron Taylor-Johnson), son of Joe and Sandra, is grown up, and a bomb expert in the military. He’s finally returning home to his wife Elle (Elizabeth Olsen), and his own young son, but no sooner does he get in the door than he gets a phone call letting him know that he is going to have to fly to Japan to get his father out of jail. Joe is now somewhat obsessed with the accident, lives as a bit of “conspiracy nut” recluse, and he was just arrested for going into the off limits zone surrounding his old power plant. With a sigh that says this isn’t the first time, and Dad is becoming a nightmare, Ford is off to bail him out. But, much as it is hard to listen to the guy who seems crazy, movie-goers know that it doesn’t pay to dismiss them, and Joe has a theory that the “seismic event” was nothing so simple. Timing being what it is, Joe convinces Ford to go back to their old house to find data disks just as the Muto is finally about to “hatch,” and because they have information about the first event, they are let in on the secret operation that is monitoring the giant creature. Not surprisingly, we underestimated what it would take to contain the creature, which slaughters countless workers and flies away. The cat is out of the bag, and we’re off to the races, but we quickly learn that another one of the creatures is out there waiting to burst forth, and once they start wreaking havoc, Godzilla shows up as well. Our current theory of updating the classic monster movie means that we’re going more directly back to the days when things were really rather goofy, but no one cared. The monsters look silly, and Godzilla has come full circle until he seems like a guy in a rubber suit again, but we put the right lighting on things and throw in a lot of other special effects. Shazam! Movie awesomeness. Moreover, there are certain elements of the action/plot that don’t hold up to the slightest scrutiny – like the idea that creatures evolved millions of years ago, when the planet was bombarded with a lot more radiation, which they absorb for energy, somehow translates into the idea that you can eat a nuclear bomb, or that a creature would have an EMP weapon ability that couldn’t possibly serve any purpose… until now. None of it matters, so the theory goes, because we are moving in a realm of more pure wacky spectacle than things that need to explain themselves, or making any sense. You have to ask yourself if that’s a worthwhile theory, and if you can differentiate the attempt from things that are just too stupid to watch, but for audiences that can just let themselves float away on summer insanity, Godzilla has nearly perfected the idea. That said, the movie makes some missteps even when we allow it the massive latitude necessary to take anything positive from the film at all. For every solid decision it makes, it throws out some that cause large portions of the film to fall flat. Ford’s character, and his own trip through the adventure, are given to us with a great twist on the main character we may expect. He may have certain skills that make him useful, but he isn’t a hero so much as he’s just the guy who can’t catch a bloody break. That gives the film a general sense of struggle that fits the goal much better than if someone showed up with real answers. Unfortunately, we have to balance this against the nonsensical idea that the military has decided to transport a nuclear bomb (as part of its grand scheme to kill these monsters) by train, taking a route that crosses a bridge the likes of which hasn’t been seen since old westerns. If you let yourself go, this one is filled with an amazing ability to entertain despite the almost unbelievable demands on suspension of disbelief, but it doesn’t know where the limits are, and isn’t completely comfortable with the scale of balancing act it is undertaking.